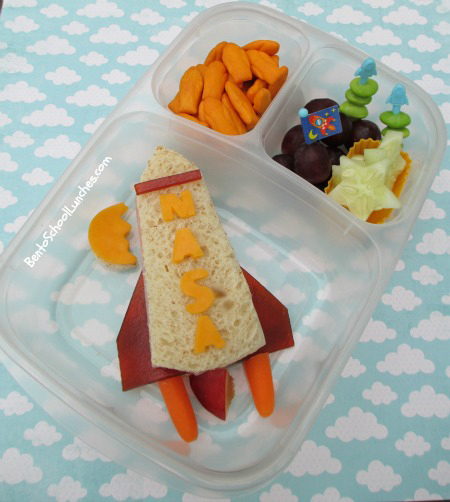 The inspiration for this NASA rocket bento actually started with the purchase of the cute and yummy rocket ship cheddar cheese crackers from Trader Joe's. I free hand cut the rocket shaped sandwich and added fruit leather fins and colby lettering. The rocket exhaust is baby carrots and fire is from a tiny piece of plum. Colby cheese moon beside it. Cheddar cheese rocket ship crackers from Trader Joe's. Seedless red grapes, edamame on rocket ship picks and cucumber slices cut into star shapes in a silicone cup. Packed in Easylunchboxes container. So creative Rina! Love it! I wish we had Trader Joe's here in Florida. They seem to have some really cute things for lunches. There is a TJ's in Naples FL where we go. That is the only one here in FL as of now. Love that rocket ship! So nicely done!